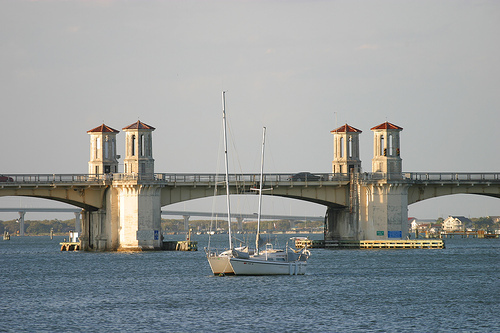 "The Bridge of Lions" over the Matanzas River is one of the famous sites of St. Augustine and specifically of the Old City. 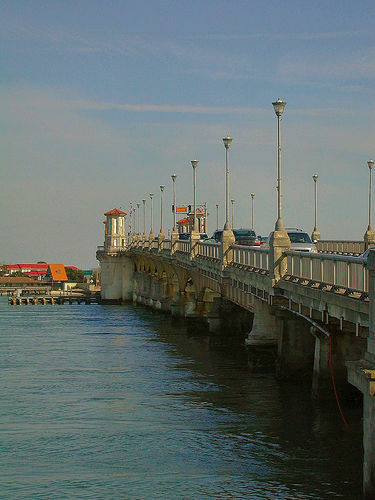 For a virtual tour of the bridge and photographs of other local bridges, see this site [free registration required; worth it.] 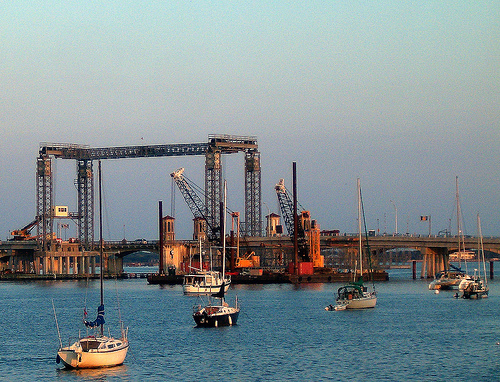 For information about the bridge rehabiliation project and the bridge's history, see this link. My hotos of it were pretty bad, since they were just scanned from old photographs. I deleted them in favor of these gorgeous photographs from the generous donors to Flickr's Creative Commons. I love the softness of the light on the towers and the way the red stands out against that nameless color I love so much, the silvery violet of the sky. This is the way I always remember the bridge. Here's another beauty, clearly taken out a time of day when the light was at that certain slant. The colors of the boats stand out so brilliantly against the water; they look as if they have been gilded. Don't know what time of day this photo was actually taken, but it reminds me of many late afternoon walks along the waterfront. It's magnificent. This last is the bridge seen from a different angle still. It looks as if it's been painting, so intense are the reds and oranges. The sky is that cerulean blue, subtly streaked with violet clouds with a rosy tinge. It's a heavenly contrast to the earthier colors of the bridge and the city beyond.